The spiritual life is often compared to a race. Pastor Rob Fuquay sees a parallel between the flags used in auto racing and the signals God sends us in our fast-paced lives. 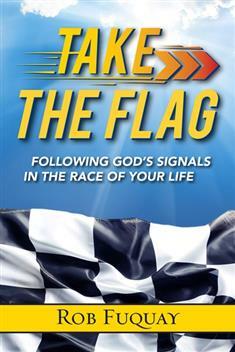 The purpose of Take the Flag is not to turn readers into race fans but to help them become stronger disciples of Jesus Christ by paying attention to the signals God gives us each day. In this Bible-based, 7-week churchwide series, Fuquay uses the flags from auto racing as a way to discuss different aspects of our life of faith. With wisdom and humor, these seven dynamic lessons will put you on course for your faith journey, helping you navigate the bumps and turns ride out the delays and pit stops, and ultimately take the checkered flag of a victorious life. Exploration and commentary on the flags from auto racing and the symbolism in each racing flag and the parallel in our spiritual life. Fuquay's personal experiences to discern GodÆs signals in their life of faith. For more information and samples, visit TakeTheFlag.UpperRoomBooks.com.